Had 3 Sufra experiences (after my first visit) in November and December. My experiences. Having tried the Original Falafel the first time round, loved it and then I had to try their other dishes. So, went back on the 29th of November 2013. 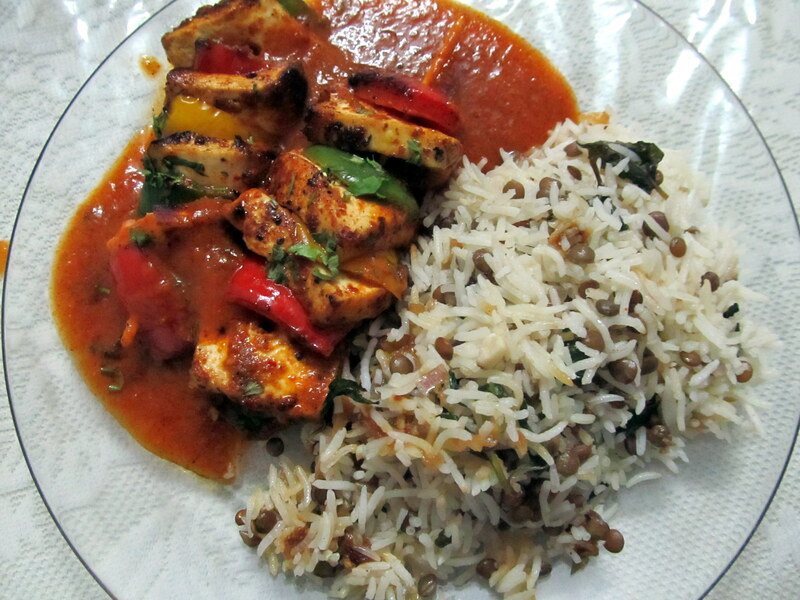 Between the Spinach Pide (Middle-eastern pizza) and another vegetarian fare, I was recommended to try the Paneer and Vegetable skewers with Moujadara. This is grilled vegetables and cottage cheese skewers served with lentil and brown onion pulao, served with their piquant tomato sauce. In non-vegetarian, was suggested The Crisp Chicken in pita pocket. This is garlic and cumin spiced chicken with lettuce, tomato, tahini, fresh coriander and mint sauce. 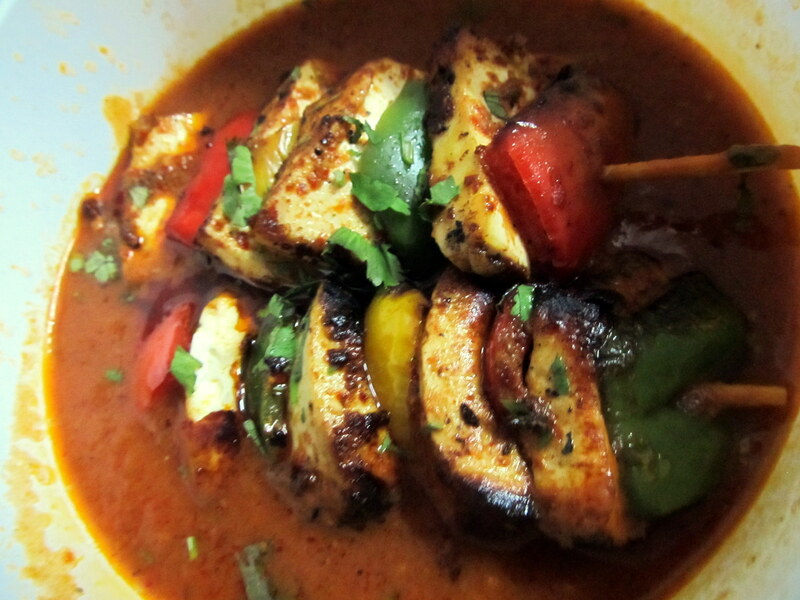 The Paneer and Vegetable skewers with Moujadara. At Rs. 225, its a tasty and wholesome meal. The skewers are flavourful. The tomato sauce is aromatic and has zest. It goes well with the pulao. 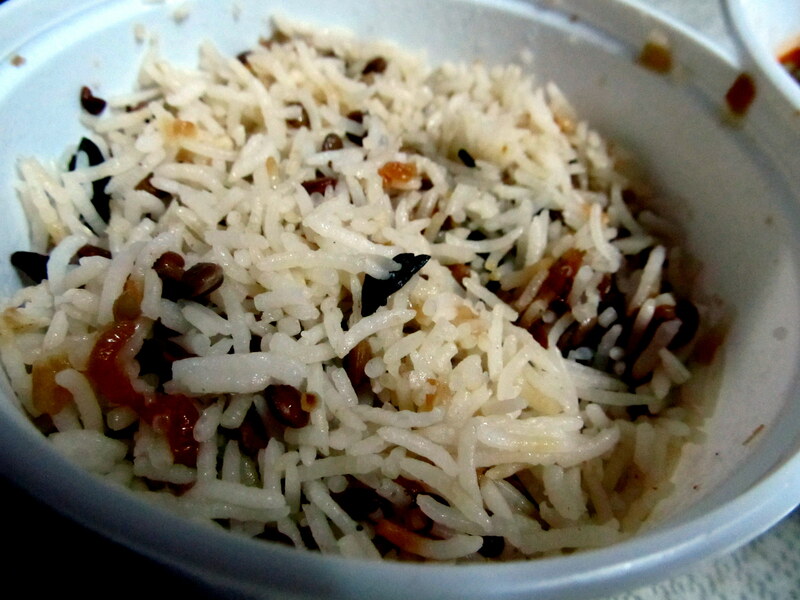 The pulao, I felt was nothing great. It was strongly scented with cinnamon, cardamon and other spices. However, on the whole its a good dish. Portion size is good and it adequately serves 1. In the above picture, the plate could not accommodate half of the rice and more of the tomato sauce. However, I am not sure if I would order this often as it is not an exotic taste or does not make me feel I am eating a Middle- Eastern fare. Its good and different but not strikingly unusual. 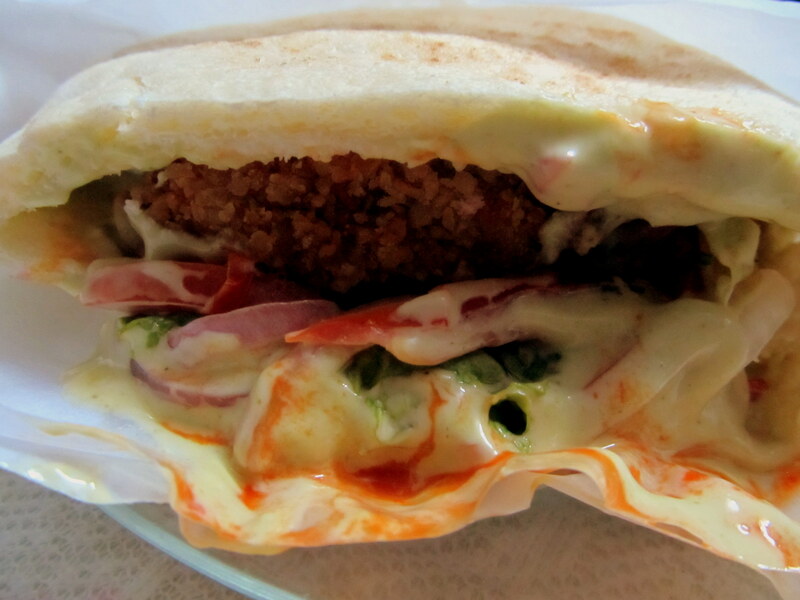 The Crispy Chicken is a non-vegetarian Falafel. Credit to Sufra for the chicken – it packs in a good flavour. On the whole its a good falafel. Gets itself a rating of 3.5 on 5. At Rs. 150 its a good meal. Experience 2 – wanted to have the Spinach Pide. Went to the outlet one night, in the first week of December. Time 7:30 pm. NO SPINACH PIDE. Ordered the Original Falafel. NO ORIGINAL FALAFEL! Experience 3 – 13th December 2013. Lunchtime around 1 p.m. I was close to the outlet. I decided to call them before reaching them for a pickup. NO SPINACH PIDE. This entry was posted in chicken, Restaurant Review and tagged Colaba, Sufra. Bookmark the permalink.